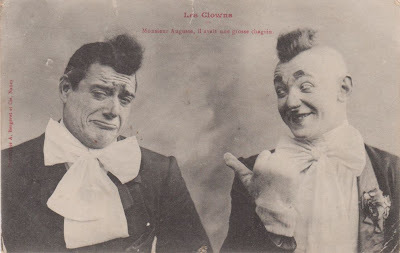 This postcard was sent in 1903. The majority of my old postcards come from the years 1903 - 1906 ish. During those years people liked to collect postcards and keep them in large albums, and many got preserved. Those were the days before telephones when things were heating up, people were travelling more, and postcards were a way of sending quick messages back home..
Monsieur Auguste and his sadness will not not forgotten.